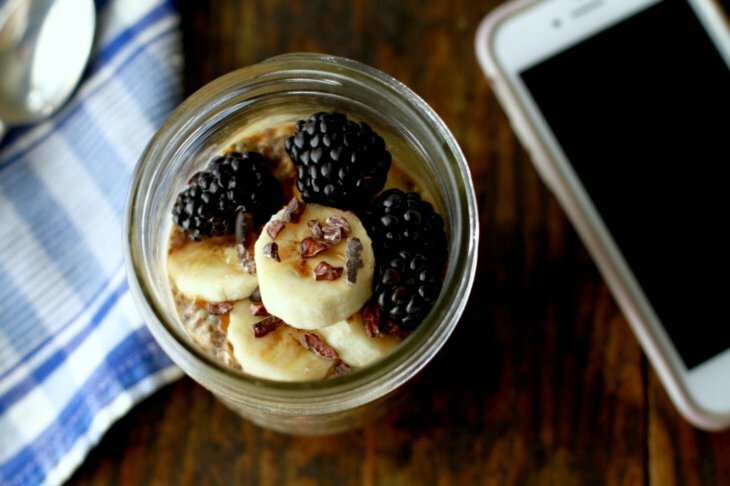 Overnight Oats are my go-to when I have a big morning workout ahead of me. For this recipe, I use old-fashioned, gluten free rolled oats. Oatmeal is high in fiber and resistant starch, which helps you feel satisfied longer while also shuttling toxins from the body. I also add chia for fiber, flax seed for heart-healthy omega-3 fatty acids, and hemp seed for protein. The chia seeds also expand when mixed with liquid, giving the mixture a pudding like consistency. Use a fork to mash the banana in the base of a 16-ounce mason jar. Then add the plant based milk and vanilla, and give it a stir. Next, add the oats, seeds, and pumpkin pie spice. Give everything a good stir, screw on a lid, and put in the fridge overnight. In the morning, stir the mixture and add a splash more milk. It could be sweet enough for you already, or you can add a drizzle of maple syrup to taste. Garnish with the walnuts and fresh banana slices, and enjoy. Tip: prep a few of these at once, and store in the fridge so you’ll have grab-and-go breakfasts for the week.